You can chase novelty forever, but some of the strangest sights are the ones that come and find you. I have a brother-in-law from France. From there – he doesn’t want to live there. Jean Paul travels around the world, preferably by sailboat, hunting, fishing and foraging for his food, maybe spending a winter in Vanuatu, a summer in Alaska. He likes to wind up in Maine for waterfowl season. Ennui. That’s a word for us, too. It describes that sense of listlessness and dissatisfaction that comes from being stuck. In other words, it’s how you might feel in the middle of a Maine winter. But Jean Paul is wrong about one thing. You don’t have to travel around the world to see something new. If you sit still long enough, they come to you. Witness the Westbrook ice disk. 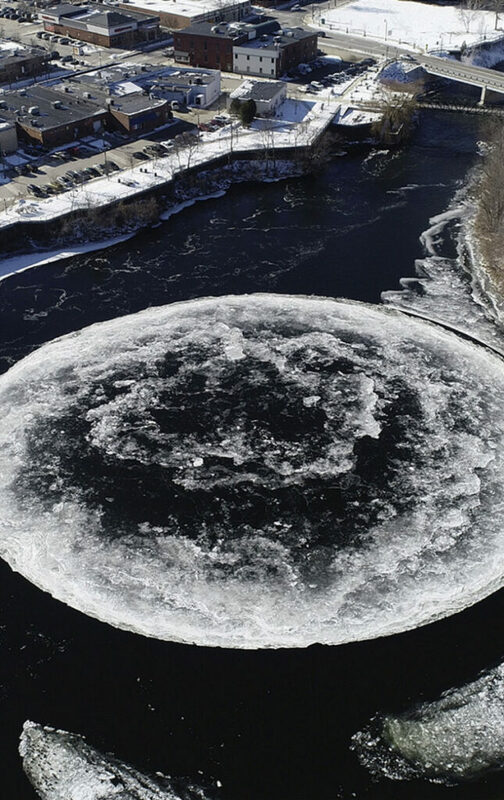 It’s a perfect frozen circle, approximately 300 feet across, rotating slowly in a counterclockwise direction in an eddy of the Presumpscot River. It has replaced ennui with wonder. Not just for us in Maine but also, thanks to social media, for millions of people all over the world. They paused doing whatever it was they happened to be doing and, using the appropriate word in their language, issued a global, collective “… whaa?” when they saw drone footage of our little slice of another world. Social media celebrity is cheap. The internet is a machine that turns novelty into dollars for somebody, and it needs new images by the millisecond to keep people staring. But the ice disk is different, it’s real. It came here on its own, and it’s going to leave when it’s ready, and all we can do about it is watch. At this writing, people in the disk’s orbit are filled with rage over a crack in its face caused by Christopher Angelo, 44, of Lavallette, New Jersey, who attacked the disk with a hatchet, a pickax and a chainsaw Thursday, in an apparent attempt to carve a giant peace sign onto the face of a natural wonder. Apparently, trying to wreck a miracle is not against the law, so there will be no charges. The crack hurts, but it doesn’t make the disk less compelling. We’ve always known its days were numbered, and to see it damaged by an out-of-control human ego makes it even more poignant. It’s also instructive. It tells us about the tragic nature of man’s need to leave his mark on the world even if it means destroying it. The veneer of civilization is paper-thin, and we are all capable of horrible acts if we don’t feel a sense of duty to each other to restrain us. Scientists say that rotating ice circles are not that unusual, that they form when there is the right combination of cold air and slightly warmer, moving water. To which I say, so what? I’ve never seen one. This is my 31st winter in Maine. They’ve all been cold. This is my first ice disk. It feels important. I remember the Ice Storm in ’98, and the year the city dumped all of its plowed snow in a parking lot near Back Cove, leaving a dirty, frozen pile that was still around when the daffodils were blooming. Other years stand out for nor’easters, Arctic blasts, polar vortexes. 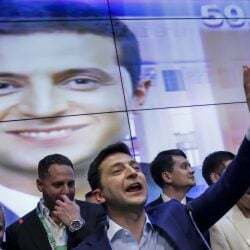 I’m afraid we might look back on 2019 as the winter that Donald Trump broke the American experiment in democratic self government. But this could be the year of the ice disk. Maybe it came to usher in a time of inexplicable surprises. Maybe all we need to do is sit tight and see what happens next.